Angerer Alm is my favorite hotel, not only in Hochgurgl but in the entire Austrian Alps. Typically for this region, this hotel has been owned and managed by one family for many generations. At present, you can meet four generations of this family in the hotel, and since they let you “live” with them, the atmosphere is personal and even private. The feeling you get when you first enter and are welcomed into the house is that you are privileged. It is already a breathtaking arrival due to the spectacular countryside – being surrounded by the Ötztaler Alps (all above 3000 m), the very polite, correct welcome is a kind of first signal of what you can expect. Ca. 60% of all rooms face the valley, which lies deep down and offers a fantastic view of an incomparable mountain range panorama. Most of the rooms are rather big and well equipped; they have really comfortable beds with agreeable linens and balconies. Since the aforementioned family almost lives in the hotel, it has a very personal touch. The decoration, furniture, and choice of colors are very well composed, although not everyone will agree with the combination of style and colors, but this is what I would call individual and therefore so unique in comparison to so many other alpine hotels. The guest rooms and lounge area on the first floor offer enough space for all of the guests. The restaurant is separated from the bar area, as well as two more eating and drinking areas, where you also can sit and work a little bit without being disturbed. The hotel also has a spa area in the basement which includes a swimming pool, different saunas and a whirlpool. While you swim, you can look out over the amazing panorama again, which makes a bit of exercise quite a pleasure. 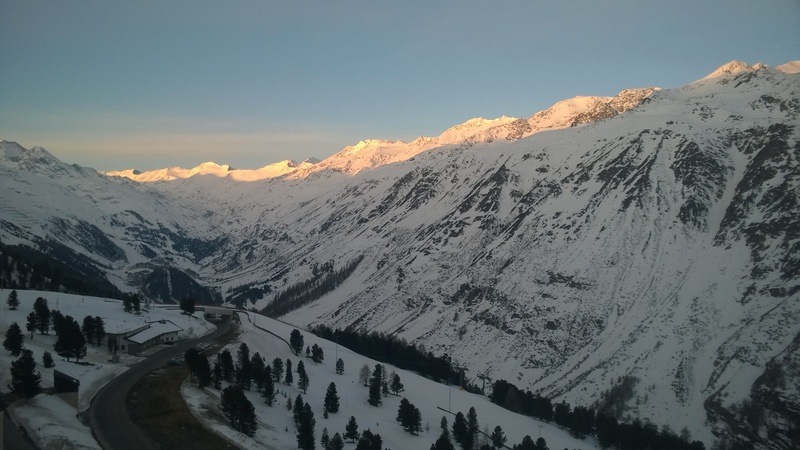 As previously mentioned, Angerer Alm is in the middle of the skiing resort Obergurgl Hochgurgl, and it is only a one-minute walk to the lift and gondola station. In so many other places, the ski storage is either close to the garage or in the cellar – without fresh air but real smelly and sometime challenging to get to, due to stairs (if you are a skier, then you know how pleasant it is to walk with ski boot on dark stairways) – the storage at Angerer Alm is just behind the reception and is thus ideally located. This hotel is, simply speaking, very well thought-out. Another plus of the hotel is their south-facing terrace which always offers a sun bath. As I wrote, Angerer Alm of course also has a restaurant. Since this restaurant is so excellent I am writing a separate post about it. Please see my review in the restaurant section. The views alone are outstanding! The snow covered vistas look great.